STARSKIN® Eye Catcher™ Lights, camera, action! Ensure all eyes are on you with Eye Catcher™, STARSKIN®’s premium Bio-Cellulose mask specially created for the delicate eye contours. Formulated with naturally fermented, vitamin-rich coconut juice, this ultra-hydrating eye mask saturates the skin with an incredible 12ml of serum containing wrinkle-smoothing Adenosine, brightening licorice root extract and soothing Allantoin. Eyes look instantly brighter, more radiant and rejuvenated as fine lines, puffiness and dark circles are diminished in just 15 minutes. An A-list essential for late night parties and long-haul flights! Refrigerate the unopened sachet for 10 minutes before use to enhance the energising and cooling effect. Before opening sachet, use fingertips to gently distribute serum evenly. Open the sachet and carefully remove eye mask patches. 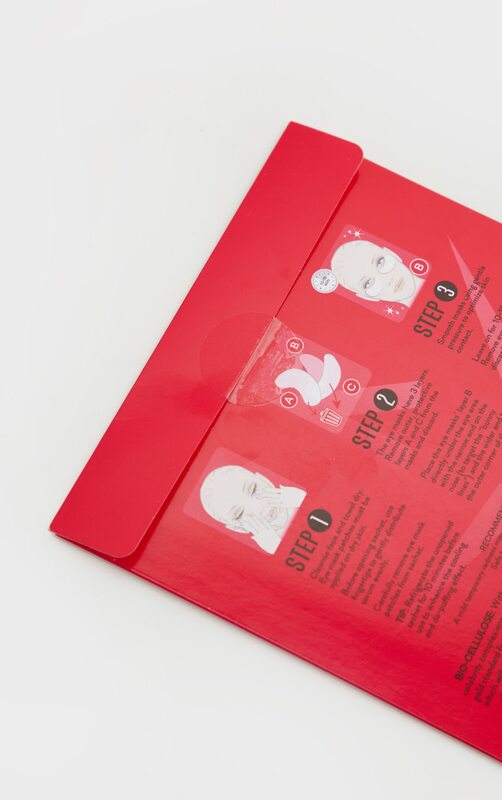 Remove and discard the protective outer layers on both sides of the eye masks. Place the Bio-Cellulose eye masks directly under the eyes with the narrow end on the nose (to target the “bunny lines”) and the wider end at the outer corner of the eye. Gently smooth the mask to optimize skin contact. Leave on for 10-15 minutes before removing the mask. Gently pat any remaining serum into the skin - no rinsing necessary. Water (Aqua), Butylene Glycol, Glycerin, Propanediol, Phenoxyethanol, Olive Oil Glycereth-8 Esters, Ethylhexylglycerin, Scutellaria Baicalensis Root Extract, Carbomer, Arginine, Glyceryl Caprylate, Xanthan Gum, Panthenol, Snail Secretion Filtrate, Glycyrrhiza Glabra (Licorice) Root Extract, Vaccinium Angustifolium (Blueberry) Fruit Extract, Euterpe Oleracea Fruit Extract, Fragaria Chiloensis (Strawberry) Fruit Extract, Brassica Oleracea Italica (Broccoli) Extract, Sodium Citrate, Polysorbate 20, Sodium Hyaluronate, Tocopheryl Acetate, Hydrolyzed Collagen, Chamomilla Recutita (Matricaria) Extract, Adenosine, Allantoin, Disodium Edta, Fragrance (Parfum), Acetyl Hexapeptide-8.